Over 86 bodies have reportedly been recovered after a passenger ferry capsized in Tanzania off the coast of lake Victoria. Hundreds more are feared drowned after the MV Nyerere ferry overturned off the island of Ukerewe. By yesterday, only 40 bodies had been recovered however, this morning rescuers resumed searching for survivors at first light where more bodies were found. 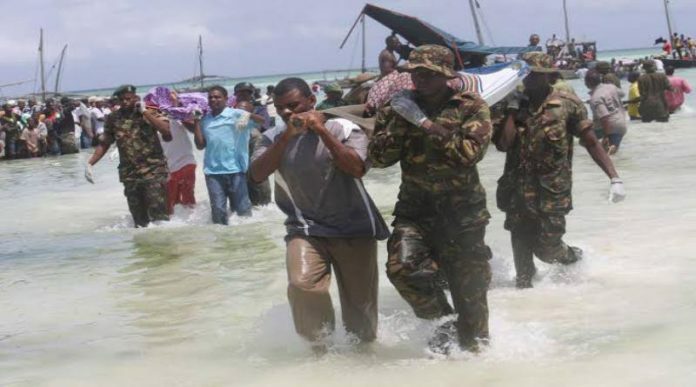 A government official says more than 200 are feared to have drowned in the disaster just a few meters from a dock as locals watched helplessly from the shore when the vessel got into difficulty just a few yards from the banks of Ukerewe, the lake’s biggest island. Some nearby fisherman were able to save roughly 30 people from the water. Local reports indicate the ferry was overloaded with up to 400 people on board however the maximum capacity is thought to be around 105. Officials have found it hard to establish the precise number of passengers on board since the person dispensing tickets had also drowned with the machine recording the data lost. Regional governor John Mongella said last night the toll had reached 44 while 37 others had been rescued, though some were in “a very bad condition”. The death toll doubled on Friday as more bodies were pulled from the water. Lake Victoria is the largest lake in Africa and the third largest, by area, in the world after Lake Superior and the Caspian Sea. It is approximately 26,590 square miles. “We pray to God to give us hope in such an accident,” Regional Commissioner Adam Malima told reporters.